For those of you who are following my posts on a regular basis, you must have figured out that I’m maintaining that “Spanish” state of mind. Last April and May, as we explored the culture of Spain on a daily basis, we’d walk far distances. Since this made us very hungry, our noses always followed the exquisite aromas of warm breads baking. 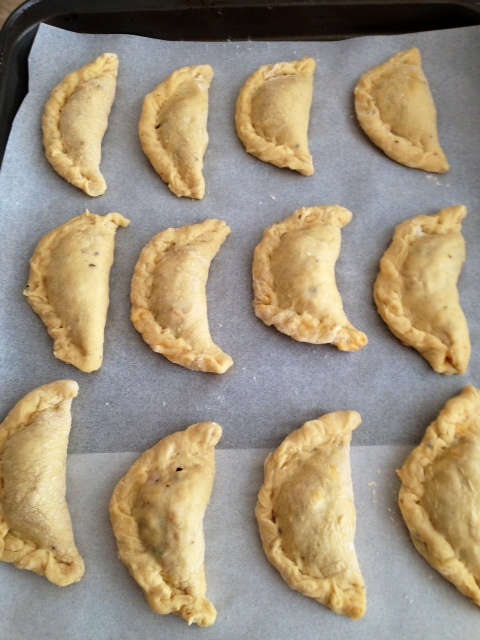 Here’s my delicious recipe for tuna empanadas. They can be made ahead of time, cooled and frozen in double freezer bags for up to two weeks. 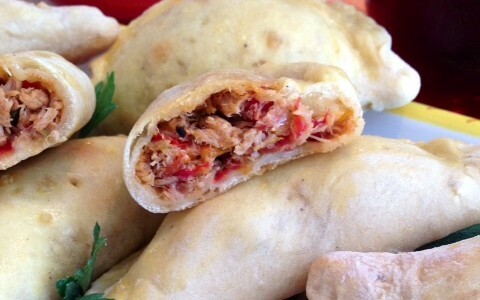 Serve these tuna empanadas as a starter for a dinner or a party – they’ll steal the show! 1. In an 4 to 6-quart mixing bowl, combine the flour, salt and black pepper. 2. Make a well in center of flour mixture; add the beaten egg-and-water mixture to the center of the well. 3. Using a fork, gradually (a little at a time) mix in the flour from sides of well until a soft dough forms. 4. With one hand holding the bowl, use the other hand to pick up the mound of dough. 5. Gently knead it inside the bowl, grabbing a little flour at a time. 6. When dough has amalgamated and it is smooth, set it aside on a smooth, floured surface. 7. NOTE: The flour surface should be either a clean granite counter or a wood board used exclusively for doughs (due to contamination, a previously-used chopping board is NOT advisable). 8. 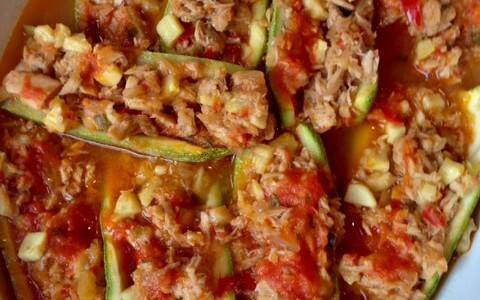 Cover the dough with an overturned bowl and set it aside while you prepare the tuna filling. 1. In a 12-inch skillet, heat the oil on medium-high heat. 2. When the oil is hot, stir in the chopped onion and bell pepper. 3. On medium-high heat, stir-fry the onion mixture until it is translucent, about 2 minutes. 4. 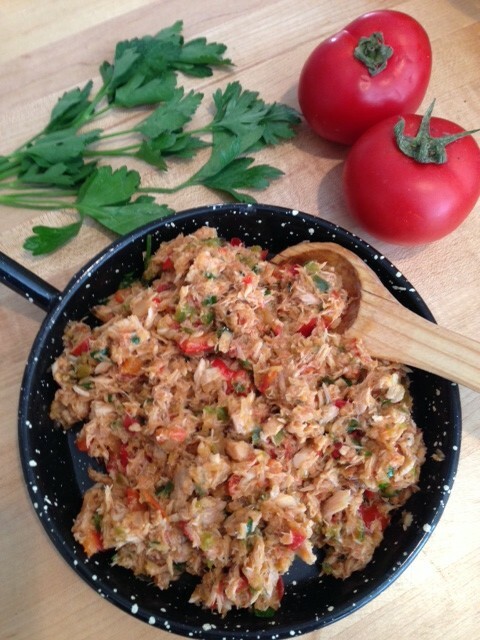 When onion mixture is translucent, add the chopped tomatoes, tomato puree and roasted bell peppers. 5. Stir-fry the onion-tomato mixture for about 3 to 4 minutes, or until the mixture has thickened. 6. When the mixture has thickened, add the drained tuna and, with a wooden spoon, break it up. 7. Cook the tuna mixture for about 2 to 3 more minutes, or until it has heated through. 8. After 2 to 3 minutes, stir in the minced parsley, salt and pepper, to taste. 9. 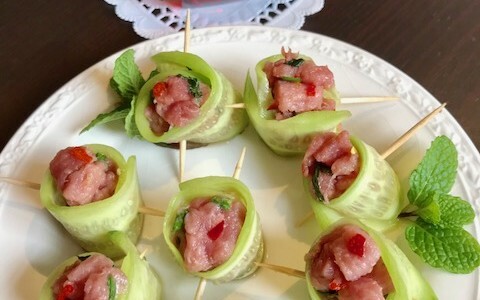 Transfer the tuna mixture to a glass or porcelain bowl; cover it and set aside to cool while you roll out the pastry. 1. Lightly and evenly flour the granite counter or wood board. 2. Divide the pastry dough in half. Set one-half of the pastry dough aside, underneath an overturned bowl. 3. Using a rolling pin, gently roll out the pastry dough to 1/8-inch thickness. From time to time, as you roll out the dough, you will need to lift it and flour the underside as well as the top. 4. When dough has been rolled out to a 1/8-inch thickness, using a 3-inch cookie cutter, cut circles into dough. 5. After cutting circles into dough, preheat oven to 375°F. 6. Line two 12X18-inch baking sheets with parchment paper; set aside. 7. Fill a 1-cup bowl with cold water; set aside. 1. Carefully lift one dough circle off surface and hold it in the palm of your hand. 2. Place scant 1 teaspoon tuna filling in center of dough. 3. Dip index finger in cold water and run it along edges of dough. You may need to repeat this so that entire perimeter of dough is moistened. 4. Fold the dough in half, creating a half-moon. Slightly press the edges closed. 5. Place the raw empanada on a lightly-floured surface. 6. Beginning at one end of the empanada, curl up the dough edges to create a scalloped pattern all the way to the opposite end of the empanada. 7. Place the empanada on parchment-lined baking sheet; set aside. 8. Repeat assembling the empanadas, lining them up on the baking sheet as you go along (each baking sheet will hold 12 to 15 empanadas). 9. When the first dough has finished, roll out the remaining dough as instructed above. 1. Separate the egg yolk from egg white. Discard the egg white. 2. In a 1-cup bowl, combine the egg yolk with 1 teaspoon cold water. 3. Beat together with a fork until mixture has amalgamated – this is the egg wash.
4. Using a basting brush, baste each empanada with egg wash.
5. Place baking sheet with empanadas on a rack positioned in center of preheated oven. 6. Bake the empanadas for 12 to 15 minutes. 7. After 12 minutes, using a spatula, lift the underside of one empanada. 8. If the underside is light golden brown, the empanadas are done. If it is still white, bake the empanadas for an additional 2 to 3 minutes. 9. When empanadas are done, set them aside on a counter to cool slightly (in baking sheet). 10. Serve the empanadas hot. NOTE: Tuna Empanadas can be made up to 2 weeks ahead and frozen in double freezer bags. To freeze the empanadas, make sure they have cooled completely after baking. When empanadas have cooled completely, carefully place them in double freezer bags, seal and freeze. TO THAW AND REHEAT: Three hours prior to serving, remove the empanadas from freezer bags and place them on a platter set on a counter to thaw. At serving time, preheat oven to 350°F. Place empanadas on a parchment-lined baking sheet, set on a rack positioned in center of oven. Heat the empanadas for 10 to 12 minutes. After 10 to 12 minutes, cut an empanada in half and taste it to make sure it is heated through.